"As a country, we’re self-confessed pet lovers and if our Instagram profiles are anything to go by – we aren’t afraid to hide it. How about taking one of those beautiful, portrait mode shots and getting a hand-drawn illustration of your favourite furry face? Introducing Perfect Pawtrait, a delightful monthly delivery you need to brighten your day! With gorgeous goodies and a few surprises in every box, your home will soon be adorned with even more ways to showcase your beloved pet. There are multiple items to collect including a mug, coaster or notebook. The talented team at PETure Perfect will not disappoint with their gorgeous digital illustration of your dog or cat. Now if you had asked me before becoming a dog owner if I wanted an illustration of my dog on various household items, I may have laughed. But then I became a dog owner. Much like plastering his adorable little furry face all over my Instagram, The Perfect Pawtrait Dog Club Box has given me yet another excuse to proudly show off Brody throughout the house and maybe even at work. I had no idea what was arriving in my first box, all I know was the hardest part about ordering was sifting through the 9,000+ pictures to send off so the team could get to work, the rest was a breeze. 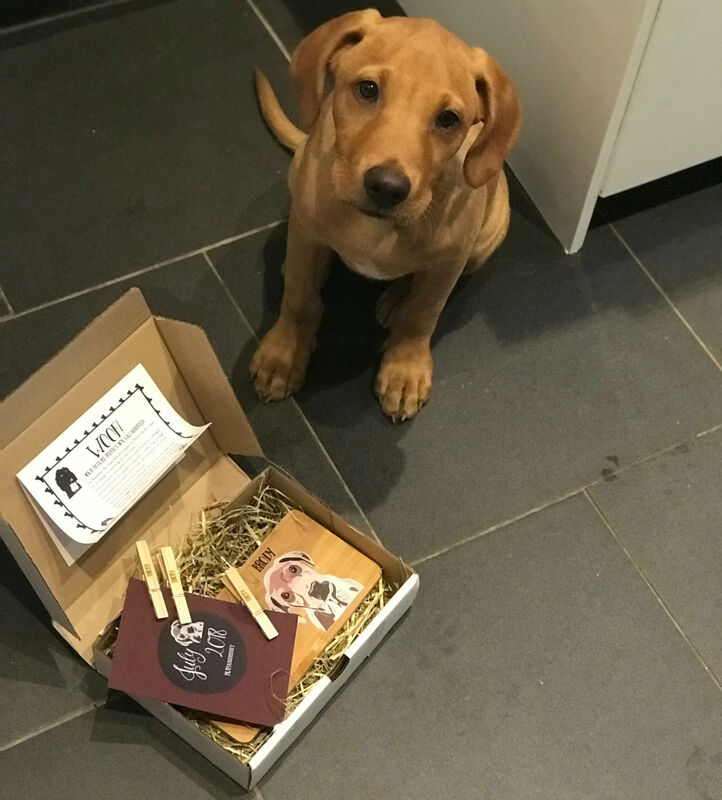 Arriving in the post, neatly packaged and reminding me pet owners deserve a treat too, I was pleased with my purchase and opened the box to find an adorable note from the head honcho puppy at PETure Perfect, Bramley. Inside this month's box, I was delighted to find a delicately gift-wrapped present in the shape of a bamboo coaster, big enough to have my cuppa and a biscuit on the side – all personalised of course with my head-tilting, camera-loving pooch. As well as the coaster, there was a milestone card to snap a pic of Brody that month (any excuse), a recipe for some doggie biscuits and some personalised pegs to keep the treats fresh. Brody was disappointed to learn that there wasn't anything for him in the box (see sad puppy eyes), nevertheless, he did take a keen interest when it came to the unboxing and I'm sure he will enjoy the doggie biscuits that I will make for him! All in all, I think this is a lovely, exciting box to receive each and every month - I'm intrigued to see just how many different items the PETure Perfect team can personalise and surprise me with over the coming months. As far as I'm concerned, there's no limit to the number of pet pictures or items a pet owner can have to showcase their pet appreciation!" Delight in a monthly delivery of gorgeous, hand drawn illustrations of your cuddly pooch. Receive fabulous goodies such as a mug or coaster that model a beautiful image of your dog. You deserve a treat too!